Cool, I like that. Thanks for the link. Instead of these being activated by clicking a link can they be activated by inserting the cursor in form field? I’d like to work out how to use these to provide contextual help items. Edwin: You should be able to customize this to look like just about anything via CSS. A little later I will look into mocking up a demo with some more creative styling. Macca: Yes, as long as the proper DOM is built you can raise a notification at any point. Here at work we often use it in response to AJAX requests. Ray: Thanks for posting about my plugin! 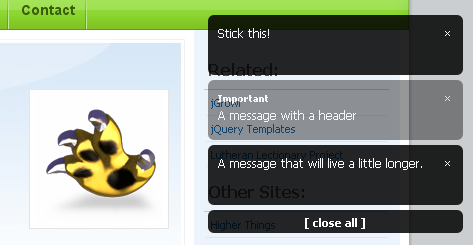 This defines a theme using the same smoke.png that the MooTools Growl library uses and it additionally defines a theme to parallel jQuery UI’s Flora theme. Little bit of CSS and you can really dress this up any way you want. How would one go about using jGrowl to provide a notification when a remote user makes an ajax form submission? Nothing fancy, just a “Someone has posted a new message” type of thing. Does jGrowl (or anything else) have the capability to remotely listen for this stuff? There are a number of ways you can accomplish this. One project I use has a generic notification pool located at a RESTful url, so after every AJAX request another AJAX request is fired off to that pool to get any “notifications” that have been raised. These then are raised in jGrowl by that request. That is though, perhaps a more complex model. Another option is simply to set the ‘success’ property of $.ajax() options object to raise the notification for you. This assumes ajax request X will have response Y or Z, Y if it fails and Z if it is successful. Broader implementations will need to be more aware of the structure for notifications, ie. if the AJAX request always returns a JSON node with a message property, then you could write a global AJAX complete method that send that message property to jGrowl. I’d like the size of the jGrowl notification to be flexible based on screen size. I have the alerts appears on the right hand side of the screen (with the default size of 235px). The rest of my screen is actually set to take of 84% of the screen. How do I convert jGrowl to use this remaining 16%? When I tried changing this in the css file, I got very small notification boxes.